Our Improved Rembrandt Tulip Mixture blooms look like they were hand-painted by the Dutch Master himself. 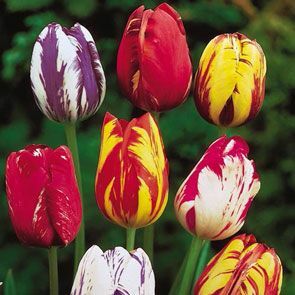 The classic tulip-shaped flowers bring nearly all the colours of spring to your landscape, including purple, orange, red and white, with an intriguing and eye-catching mixture of shades. These Rembrandt tulip bulbs come to life in mid to late spring, at the height of the blooming season, to paint your garden with fabulous colour. Improved Rembrandt Tulip Mixture flowers do very well in zones 3 to 8. Plant your perennial tulip bulbs in the fall for spring blooms. 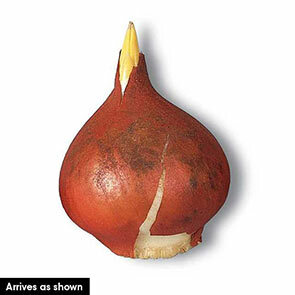 Begin by burying the Dutch bulbs about 6 inches deep and 3 to 6 inches apart. For the best results, choose a sunny or semi-shaded location with well drained clay, loamy or sandy soil. When fully mature, the stems stand about 20 or 24 inches high with showy 4-inch cup shaped blooms. In addition to the vibrant and varied colours, these flowers have feather-shaped petals that make them even more head-turning. Consider planting these Rembrandt tulip bulbs alongside other multicolour flowers, like a kaleidoscope tulip mixture, for a stunning and long lasting display. The tulips have also breathed life into spring bouquets ever since the first wave of "Tulipomania" in the 17th century. Enjoy all the colours of spring with these perennial tulip bulbs. Recreate "Tulipomania" in your garden. That phenomenon gripped Holland in the 17th century and literally fortunes were spent for just a single bulb. Most prized were the Rembrandt Tulips, noted for their intriguing colour patterns. At last hybridizers have succeeded in creating these improved, superior, upmarket varieties so that we can offer them to you. Flowers bear an even more remarkable, striking resemblance to the tulips depicted by the Dutch Masters, hence their higher cost and value. This special mixture of modernday Rembrandt Tulips from Holland features a colourful array of feathered, variegated 4" blooms that are stunning in the garden and in bouquets. Flower Form 4" upright, double, bell or funnel shaped.